Christmas is a time for all the family and that includes our fuzzy friends right? There are so many ideas for dog Christmas presents around nowadays that they are really spoilt for choice. Here’s some of my favourite things to make the festive period one that’s full of good treats and fun times for your dog. When it comes to choosing a good Christmas present for a dog there’s a few options that I think are winners. Anything to do with food, playing or sleeping! There’s also the dog outfit as well, but who are we kidding, that’s for our benefit! Here’s some good ideas for presents and read on below for more ideas for food related gifts. No Christmas is complete without a turkey! This dog toy is quite large, about 40cm long, and so is good if you have a large breed of dog that finds the smaller toys to be a bit useless. It has a squeaker inside it and is just a good bit of fun really for dogs who like fluffy toys! See this item on Amazon here. My dogs love long toys like this one that they can throw around and chase after – it provides a LOT of fun for a good amount of time so I always like to get them new ones at Christmas. This is a good make, stuffingless and it’s apparently invincible so good for crazy chewers. You can’t leave out your dog in the Christmas Jumper annual photo can you? I like this one as it comes in a variety of sizes so good for big as well as small dogs. It has the adorable Rudolph on the back and just looks ever so cute! We often overindulge, have too many sweets around and just way too much food at Christmas. It’s easy to think that as a one off we can pass on a few tidbits to our dogs, but it’s especially important to make sure they don’t get hold of chocolate or other bad food. If your dog has intolerances or isn’t used to rich food it’s even more of a good idea to keep an eye on their intake – you don’t want to be dealing with an upset tummy on Christmas day. There are some good options if you want to give your dogs a special treat but don’t want to upset them. The first I am going to suggest is this tinned food by Lily’s Kitchen, one of my favourite dog food makes. What I like most about this make is that they make real food which is high quality and I believe our dogs definitely deserve that on Christmas day, and every day! This dog food is called Three Bird Feast and contains turkey, goose and duck as part of the ingredients as well as those other staples, parsnips and cranberries! It would make a really nice special treat that they can have at any time of the year but especially Christmas! You can see more about this dog food at Amazon by clicking here. Another from Lily’s Kitchen is these Fabulously Festive Biscuits for Dogs. Having some treats on hand that are specifically for your dog when the chocolates and biscuits are being handed out is a good idea so that it’s not tempting to just give them something that is bad for them. I love these biscuits as again they don’t have any additives or preservatives and are in a traditionally turkey and cranberry flavour. They come in a pack of 3 and would also be a great gift for someone you know with dogs themselves. Good Boy make a lot of treats that you can get for your dog, from chocolate orange pieces, to mince pies, to this selection box. It’s a slightly cheaper option than the Lily’s Kitchen treats so if price is a concern then these would be a good option. In this selection box you get choc drops, turkey and cranberry bones, yuletide yummies, beef flavour biscuit bones, munchy sticks and a larger Hohoho boone. To see some of the good boy christmas treats on Amazon click here. Having a garden that is not only a nice have for yourself but is also safe, fun and interesting for your dog to enjoy is the best of both worlds. Here’s some tips on creating a dog friendly garden for you and your mutt to adore spending time in! Ok, the first one is an important, but boring one. The best thing you can do to keep your garden being a nice pplace to be is to keep on top of the cleaning of it. Most likely you’ll find that your dog uses your garden as a toilet and even if you manage to get them to relieve themselves on a walk, you’ll probably still find them marking their territory around the garden every so often. Having some dog friendly cleaning solutions is also really important. Check the label and go for less toxic varieties if you can. There are a few plants that you’ll want to keep away from if you have dogs. Even some common plants such as daffodil bulbs can be poisonous and shouldn’t be planted (especially if your dog is a digger) For a more comprehensive list check this list from the Dogs Trust out. Having somewhere to escape the elements, whether that’s the sun or rain is important. If you have a nice big tree casting shade that will not only keep the garden interesting, but it will provide some nice shade. A dog house might be worth getting if your dog enjoys being outside in all weathers! It at least gives them their own space to enjoy. A secure garden that they can run, play and explore without you needing to worry about them escaping is essential. If you know it’s secure you can really let them explore at their own pace without needing to have an axis eye over them at all times. Us being anxious isn’t good for them and they know when we are, so if you can eliminate that all the better. Finally it wants to be an interesting place, perhaps with some different areas to sniff round, toys in the garden they can use and plenty of space, if you have it, to run around in. Perhaps you could use the space and teach your dogs some tricks or agility? If either your home set up or your dog fits a life outside then there’s some things to consider before deciding to keep your dog outside during the day. This is not intended to be a ‘should you or should you not’ keep your dog outside debate post – everyone’s set up is different and if you live in the countryside with no neighbours and have working dogs, your situation is going to be a little different to someone who lives in a built up town. Again, it’s one thing to have your dog outside permanently to wanting them to be outside for a couple of hours a day while you work or pop to the shops. Remember that your dog’s welfare is your responsibility so you must make sure their needs are being met. dogs are social creatures. It’s better if you have more than one dog together if you’re going to have them outside and if not then make sure to have plenty of interaction with them. Hiring a dog walker or companion is a good idea if you’ll be out for a long time so that your dog can get some exercise and social time. A secure space is one of the top considerations if you are keeping dogs outside, make sure that your garden is secure and that they can’t escape or be stolen. A dog run might also be worthwhile considering too. shelter is essential. Being able to escape the wind, rain or even sun is a must. A dog house that they can retreat to will mean their own comfy spot. Insulated houses will help in the cold – check out my best dog house reviews. As well as a dog house, some shade is a good idea especially in the summer when it might be too hot in the house as well. Always have plenty of clean water available. Consider bringing your dogs inside over the coldest months of the year. 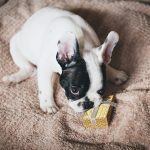 What are the new puppy essentials? You may find that you’ll get a collar when you pick up your new puppy but if not you’ll need one and a lead to attach to it. It’s a good idea to get your dog used to wearing one as soon as possible so that it’s not a huge battle in the future. Soft webbing collars are good for puppies as they aren’t as heavy and stiff as leather ones. Your new puppy will need some form of identification like a dog tag. You can get these really easily from local pet shops or even online. In the UK you need to have the name and address of the owner inscribed and of course you could also add a phone number as well. Having his own little space to sleep is essential to make your puppy feel at home. A small dog bed that they can curl up in and feel safe is a really nice idea, or you can just go with a cushion. Make sure it’s washable as there are inevitably going to be some accidents! A crate is also recommended to give your puppy his own space where he can go if things are too much and aren’t a cruel cage like some people think. A crate will keep a puppy in his space overnight and contain any toilet mess that might happen and can also keep them from annoying other dogs you might have as well. Special puppy food is recommended when you first bring them home. Always check what food they are used to because any sudden changes might lead to upset tummies and diarrhoea. If you can get the same as what they were eating before and if you need to change it to something else, do it gradually. Treats are also a good idea for when you begin to train your new puppy. Get something that is suitable for very young dogs. Self explanatory really! You need something to put your new puppy’s food in and to have a drink on hand at all times. Something that they can chew on is recommended. Don’t go for too many or anything too complicated, just something chewy and simple is best to start with so your dog will know which one is his. you don’t need to go all in just yet with lots of stuff – just the simple equipment in the beginning is best to get your dog used to it all. Perhaps some dog shampoo that is suitable for puppies and a small brush. The following bits of puppy accessories are good to have but aren’t quite essential! When you’re toilet training your new puppy you can go the old fashioned way and use newspaper, or you can try out these puppy training pads. They work essentially the same way and if you have smooth flooring they can be fixed down so you don’t slip which is a great idea. These are a good buy. If you want to keep your puppy contained but have a large area to play in, maybe because you have bigger dogs, cats who aren’t yet happy with them or young children you want to be more aware of, a playpen like this could work well. It’s also good for when you want them to play in the garden but are worried they are small enough to get through the fence and run off! This is especially important if you have a long haired breed that sheds a lot – get a specific pet hair vacuum and you’ll be good to go. Take a look at my reviews of the best vacuums for pet hair. How to workout with your dog to keep you both fit! Getting a dog is an excellent way to keep yourself fit, but if all you ever do is a leisurely stroll to the nearby park with him it won’t be the fat burner that you were expecting! Exercising with your dog and having them along side you as you do your sports is a great way to bond with your dog and get you both fit at the same time. But how to workout with your dog? Well, you need to think about what dogs like and incorporate that in to what you want to do! Remember that although dogs love to be active, they are just like us and that they will need to work up to the longer activities. Take your time to increase their stamina and don’t jump head first in to it. Follow your dogs lead and if they enjoy it, keep it up! If you love getting out for a walk with your dog and want to increase the variety and types of walking then hiking is a good next progression. Expanding your horizon to more varied terrain, longer trails and hill walking will work different muscles, get a great amount of fresh air in to both of your systems and just get them exercised enough that they aren’t frustrated at home, leading to digging or scratching behaviours. Running is an excellent thing to do with your dog if they have the stamina to keep going with you. It’s simple, you won’t need much extra equipment (although perhaps a running dog harness will be beneficial) and you can start from your own doorstep. If you’re used to long runs then maybe go on some smaller runs with your dog first to see how they do and progress from there. Much the same as running, cycling allows your dog to run along side you as you ride and is a great way to add a different exercise to your repertoire! If your dog isn’t a great runner and is small enough you could always get a dog basket for the bike and carry him while you ride! Otherwise known as Doga, dog yoga might be a fun thing to try with your pup! I will admit I haven’t tried it myself but some people find it’s a really good exercise to do together. Have you tried it? What’s your favourite way to workout with your dog? Let me know in the comments! Author SarahPosted on August 24, 2016 Categories Dog chatLeave a comment on How to workout with your dog to keep you both fit!